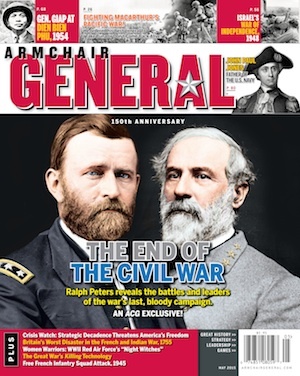 Armchair General September 2014 – PATTON: THE MOVIE! From Real to Reel | Armchair General Magazine - We Put YOU in Command! SPECIAL FEATURE Sino-Japanese War, 1979. China sought to “Teach Vietnam a lesson,” yet both sides claimed victory in this short but bloody war, by James H. Willbanks. EXTRA FEATURE The Patton Film: From Real to Reel. The legendary general’s renowned biographer reveals the true story of how the iconic movie was made, by Carlo D’Este. 10 QUESTIONS General Paul X. (“P.X.”) Kelley. Armchair General® interviews the former commander of the U.S. Marine Corps, by John Ingoldsby. COMBAT! Screaming Eagles Attack Carentan, 1944. Choose the correct plan for pinned-down paratroopers to capture a key position in France, by John Antal. YOU COMMAND Battle of Cholm Pocket, 1942. As Major General Theodor Scherer, YOU must lead a surrounded battle group in a desperate attack against Red Army forces, by Andrew H. Hershey. YOU COMMAND SOLUTION Historical outcome and winning Reader Solutions to Combat Decision Game #62, Anglo-Egyptian War, 1882. WHAT NEXT, GENERAL? Battle of Culloden, 1746. As Prince Charles Edward Stuart, YOU must decide how your Scottish forces will defeat an English army, by Richard N. Armstrong. BATTLEFIELD LEADER Edward: The Black Prince England’s famed Hundred Years War commander. BATTLE STUDIES Battle of Cedar Creek, 1864 Ralph Peters examines the Shenandoah Valley campaign. SPECIAL FEATURE Palo Alto and Resaca de la Palma, 1846 The opening battles of the Mexican War. 10 QUESTIONS Robert Dalessandro An interview with the chairman of the World War I Centennial Commission.